Did you know that creative commons and public domain are different terms yet so close to each other? Are you an artist, inventor, author, filmmaker, copyright owner, or seeking patenting rights for your other works? You might come across the terms and in the push to differentiate them, getting their varying characteristics might help. Creative Commons is an organization (non-profit) that was founded in 2001 with the main function of creating and distributing general licenses. The licenses govern how people and inventors can use their work, indicate the tenets under which it can be shared and distributed, as well as governing how it is to be reused. The licenses that Creative Commons uses are varied. In return, they vary the restrictions of the particular work’s reuse. The concept of Creative Commons operates on the fact that the public has common access to the items in question. A Creative Commons (abbreviated as CC) is among the numerous and public copyright licenses enabling free distribution of otherwise copyrighted works. The license is applied when an author, for instance, wishes to give permission to their readers to share, reuse, and build upon work that they have created. The license also protects the users of such works from copyright infringement concerns if they adhere to the specified conditions upon which the owner of the work distributes it. All Creative Commons licenses require that any reuse of any materials or works must have the attribution of the author, creator, or owner. Some licenses also demand that the derivative works bear the same licenses. They might also limit the reuse of such works to non-commercial only or deny any user from creating derivative works all together. CC0 – Freeing content globally without restrictions. What is a Public Domain? The concept of public domains has been in existence since the 18th century. It has its roots attached to the ancient Roman law and is affected by different factors. In its entirety, it means that any work put under it can be used freely by anyone and for any purposes without being restricted by copyright restrictions. When works are in the public domain, it means they are free since no one can claim ownership or control over it in any way. However, any work that is in the public domain in one jurisdiction doesn’t have to be in the worldwide public domain. This is because there is a variation in copyright laws across different jurisdictions. In case the creator of a work has retained residual rights, the term public domain is not applied. In such a case, the work is distributed with the terms “with permission” or under license”. Creative Commons is a not for profit organization that seeks to provide licenses that people can use with their works. The licenses govern how the users reuse or distribute the works under the license and have to abide by the terms contained therein. Creative Commons can also refer to such licenses issued by the organization. Public Domain, on the other hand, means that any work placed under it can be used by anyone and for any purposes. The license also lifts any copyright restrictions unless under special conditions like when the owner retains residual rights. Creative Commons licenses are based on four restrictions while the Public Domain ones can only be restricted when the owner of a work retains residual rights. Any work under the Creative Commons licenses requires the attribution of the owner while any work under the Public Domain licenses does not require any attribution or credits to the owner. Creative Commons and Public Domain are closely related terms. In the long run, they both can work separately or jointly depending on different factors. As for the differences, they make it easy for one seeking either to know what would work for them and what they should go for depending on their needs. Sarah Brown. 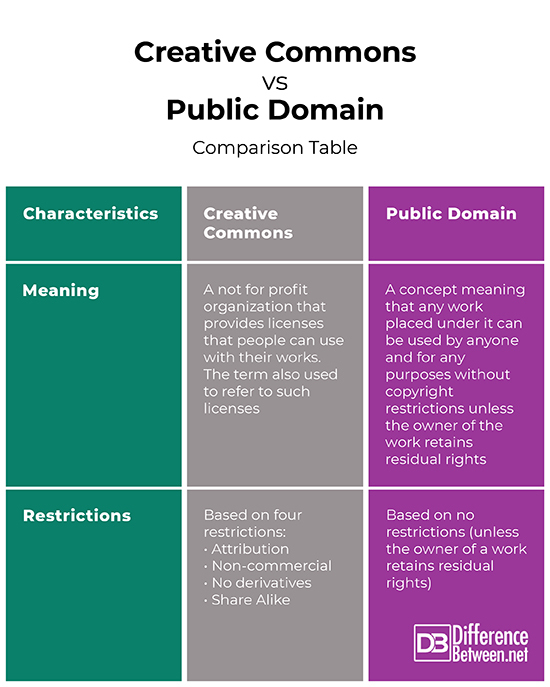 "Difference Between Creative Commons and Public Domain." DifferenceBetween.net. April 4, 2019 < http://www.differencebetween.net/business/difference-between-creative-commons-and-public-domain/ >. "Copyright, Creative Commons, And Public Domain – UH OER Training". Pressbooks-Dev.Oer.Hawaii.Edu, 2019, http://pressbooks-dev.oer.hawaii.edu/oertraining/chapter/cc-copyright/. Accessed 6 Feb 2019. "Creative Commons, Royalty Free, & Public Domain Licenses » The Indie Design Co.". The Indie Design Co., 2019, https://theindiedesign.co/creative-commons-royalty-free-public-domain-licenses/. Accessed 6 Feb 2019. "Research Guides: Public Domain And Creative Commons Media: Public Domain Vs. Creative Commons". Researchguides.Ben.Edu, 2019, https://researchguides.ben.edu/free-media. Accessed 6 Feb 2019. "What's The Difference Between Copyright And Creative Commons? | Work Made For Hire". Work Made For Hire, 2019, https://www.workmadeforhire.net/the-rest/whats-the-difference-between-copyright-and-creative-commons/. Accessed 6 Feb 2019.